About us. How I started and I walked into the magical world of sugar art. 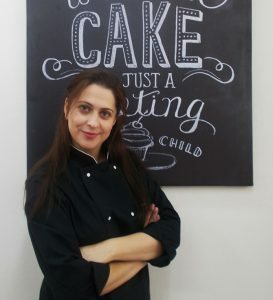 I’m Eleni Moustoula and I am one of the two members of the Alchemists of cakes. I have studied interior design. Cakes with sugarpaste was my hobby but now is my main business activity. I am self-taught in artistic pastry and my first contact with the magical world of sugarpaste was made in November 2011 marking the seventh birthday of my daughter. I had been completely ignorant of how a cake with sugarpaste can be made so I started looking for information and tutorials on the internet. The final result was really good, considering it was my first cake. It was the first time discovering that I really had a special talent in something. My development was actually very steep. There were too many suggestions from friends to make cakes for their children or themselves. Focusing on the appearance and the taste , I was able to enhance the cake with rich filling and internal moist. I kept improving myself with many hours of work using just a small amount of tools and without even use of cutters. I kept going like this until the summer of 2014 and I had been receiving numerous queries on whether I contact workshops. This is when I accepted an invitation to do seminars in Athens. I accepted that proposal and announced a seminar in October of that year. It was a huge surprise to me the response and the demand for this seminar . Within 24 hours, a record time, four days of seminars were fully booked . That day changed everything for me. There were too many suggestions to deliver seminars abroad. That way a dream journey has started with seminars in Greece and abroad, which continues until today. In 2015, I opened my own school in Athens organizing seminars at all levels (beginners – medium level advanced ). I aim to transfer my knowledge and my experience to those who have the same passion as me for artistic pastry. I think it’s time to present the second member of the Alchemists of cakes. He does not like at all to mention his name (it is the first time I talk public about him). He is the first man who believed so much in me .He is my greatest supporter and at the same time the most strict judge. He is the one that designs and makes the constructions for our gravity cakes or cakes with motion. He creates always crazy patents. He is the one who sets the objectives for Alchemists of cakes which are almost always unattainable. With his constant encouragement, he convinced me that I have to make my cakes with cream and syrup, when everyone was saying that is impossible with this type of cake internal to have also an excellent external appearance, or they were saying that this type of cake will collapse. And it was him who taught me that everything but can be done as long as you believe in ,insist and try really hard . Many of the cakes are inspired by him. He is a man who whenever he decided to make a cake ( a couple of times to show me that everything can be done), I was so surprised that I was wondering, if he had a greater talent than me, at sugar art. John is the mind and the soul of Alchemists of cakes and without him nothing would as such !! !